In this article, Emanuele Ottolenghi unearths new and previously unreported faults in Gary Sick's research and further discredits the October Surprise conspiracy theory. Sick has responded on his blog. Ottolenghi has written a rejoinder where he rebukes Sick's retort and addresses his new allegations. The so-called "October Surprise" plot that briefly enthralled the American public twenty years ago is one of the most influential political conspiracy theories in U.S. history. 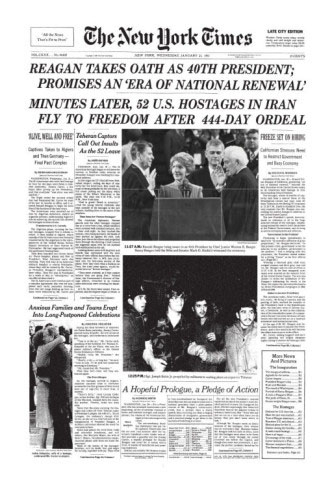 As the story goes, fearful that the release of fifty-two American hostages in Iran before the November 1980 presidential election would secure President Carter a second term in office, the campaign of Republican candidate Ronald Reagan agreed to funnel weapons to the Islamic Republic in exchange for a delay in the hostage release until after the vote. The 1986-87 Iran-Contra affair helped fuel the tale of an "October Surprise." Although subsequently discredited by congressional inquiries and journalistic critiques, the myth that Ronald Reagan's 1980 presidential campaign had made a secret deal with Iranian hostage-takers persists. First floated by Lyndon Larouche and his followers shortly after Reagan's landslide victory, the conspiracy theory remained obscure until the Iran-Contra scandal suddenly gave the idea of such collusion an aura of plausibility. Since the Iranians clearly had it in their power to have an impact on the 1980 election, it was not unreasonable to surmise that they would have sought to leverage this influence. Those who loathe the political right in the United States found it difficult to accept that the Iranians held off on releasing the hostages until after Reagan's inauguration without some form of quid pro quo. The first to lend gravitas and mainstream credibility to allegations of a delay-for-arms deal was Gary Sick, a member of the National Security Council under Carter and his chief advisor on Iran. Now at Columbia University, Sick had written a well-received book on the 1979 Iranian revolution and ensuing hostage crisis, All Fall Down: America's Tragic Encounter with Iran. In an April 1991 New York Times op-ed, Sick wrote that "hundreds of interviews in the U.S., Europe, and the Middle East" with mostly anonymous sources had led him to conclude that "individuals associated with the Reagan-Bush campaign of 1980 met secretly with Iranian officials to delay the release of the American hostages." Later that year, he published his findings in October Surprise: America's Hostages in Iran and the Election of Ronald Reagan, an account that combined a heavily footnoted script with sensationalist revelations about political corruption and treason. One man's accusations have not had such a sweeping impact on public perceptions since the McCarthy era. With all of the major television networks covering the story incessantly, a January 1992 poll showed that 55 percent of Americans believed the allegations. With the United States still reeling from the Iran-Contra affair, Sick's accusations triggered a string of devastating journalistic critiques and two congressional inquiries that definitively discredited the October Surprise conspiracy theory. However, while Sen. Joseph McCarthy was destroyed by his irresponsible allegations, The October Surprise made Sick a star. Today he is a much sought-after commentator on Iran and Middle Eastern affairs with frequent appearances on CNN and C-Span, columns in The Daily Beast and Foreign Policy, and a solid scholarly standing at Columbia—despite having published no subsequent books. This success is indicative of how lucrative stridently politicized pseudo-research on the Middle East can be. While many of his liberal compatriots have come to acknowledge that the specific allegations he put forth in October Surprise are unfounded, most are unwilling to discard either their lingering suspicions that some form of delay-for-arms deal was made or find significant fault in Sick himself. If he got it wrong, the consensus appears to be, it was an honest mistake. However, a close examination of one glaring misstep by Sick—largely unnoticed until now only because his book was discredited on other grounds—raises new questions about this verdict. Much of his argument rests on testimony he obtained from Ari Ben-Menashe, an Israeli who claimed to have been a top Mossad agent deeply involved in Iranian affairs. Central to his story is Mehdi Kashani, whom Ben-Menashe placed both in Israel in early 1980 as an emissary of the Islamic Republic looking for an arms deal, and in Madrid and Paris during the spring, summer, and fall of that year as a member of the Iranian teams involved in the alleged meetings with the Reagan campaign. As it turns out, the Mehdi Kashani described by Ben-Menashe in his conversations with Sick and in his 1992 memoir Profits of War, does not exist. He is a phantom with a life story that casually blends public domain biographical information of two very different, real-life individuals with similar names—Mehdi Kashani, a government official involved in arms procurement, and Seyed Ahmed Kashani, scion to a prominent religious family and himself an Islamist politician—into a single, unlikely narrative. Ben-Menashe's descriptions of the fictional Kashani—his activities, his Iranian regime connections, and his whereabouts—suggest that he was not sufficiently familiar with either of the real life inspirations for his character, or with Iran in general, to detect his mistake. That Sick—by all accounts an intelligent, seasoned observer of the country—carried forth this ruse was not an honest mistake but a willful dereliction of professional ethics. Ben-Menashe was a latecomer among self-declared participants in the October Surprise conspiracy, claiming involvement only after he was arrested in 1989 for attempting to sell U.S.-built military transport aircraft to an undercover U.S. customs agent posing as an Iranian emissary (an early telltale sign that he was not very well connected). He was acquitted of the charges after testifying that he had the secret approval of both the U.S. and Israeli governments and then began approaching anyone who would listen with an elaborate, self-glorifying account of international intrigue and realpolitik that grew "more richly detailed with each telling." Ben-Menashe claims to have been a Mossad agent posing as a student in Tehran during the late 1970s. There, according to Sick, he "became acquainted with a number of student leaders on the campus, most notably Ahmed Kashani, a young student who was a teaching assistant in a university seminar" whom he identifies as a son of the late Iranian cleric Ayatollah Abolqasem Kashani. Ahmed was "a man with a famous name, whose family retained some political power and had its own network of influence." Ben-Menashe told Sick that Ahmed Kashani always used the first name "Mehdi" in their dealings, and he casually substitutes this nickname when writing in Profits of War of "Sayeed Mehdi Kashani, the son of Ayatollah Abol Qassem Kashani, who at the time was an opposition Shiite leader living in the holy city of Qom." He also claimed that Kashani came to Israel in early 1980 to negotiate an arms deal, which led to the delivery of tires for Iranian F-4 fighter aircraft. According to Ben-Menashe, Kashani's father "was now a member of the ruling Supreme Council," ostensibly explaining why a former teaching assistant was suddenly a jet-setting arms broker for Iran's ruling mullahs. According to Ben-Menashe, Kashani was present at all four rounds of talks allegedly held between the Reagan campaign (including campaign chief William J. Casey, who would later become the head of the CIA, and possibly George H. W. Bush) and the Iranians—two in Madrid in May and July 1980 and one in Paris (which Ben-Menashe claims to have attended) the following October. Ben-Menashe's testimony should have raised red flags for someone with Sick's knowledge of Iran. To begin, Ben-Menashe highlights Kashani's lineage as proof of his standing with the new Iranian regime, a detail that Sick took to be true: "Kashani's father, Ayatollah Abol Qassem Kashani, was now a member of the ruling Supreme Council." However, the ayatollah died in 1962—long before the revolution or the late monarchical era when Ben-Menashe placed him as "an opposition Shiite leader." Nor for that matter does Ben-Menashe's description of the circumstances of his friendship with Kashani hold water. For one thing, it is unlikely that the real Mehdi Kashani, born in 1943, would have been a student contemporary of Ben-Menashe in 1978 when, at thirty-five, Kashani might already have been in the midst of his professional career. For another, it is inconceivable that Seyed Ahmed Kashani, son of the late prominent ayatollah with a powerful network of influence to rely upon, would be employed as a lowly teaching assistant at the age of thirty-one. If anything, had he been at a university, he would have been a professor or an otherwise accomplished professional had he been pursuing a different career. Indeed, two years after his supposed campus meeting with Ben-Menashe, Kashani was already a member of parliament. Moreover, given his lineage and radical political leanings, it is very unlikely that Seyed Ahmed Kashani would have been willing to broker arms deals with the United States and Israel and virtually inconceivable that he would have been allowed to play such a role. As a member of parliament from 1980 to 1986, he was an outspoken left-wing, Islamist radical and critic of the government. His brother Mahmoud was even more of a problem as a presidential candidate. The Kashani brothers were very much in step with the politics of their father, a firebrand radical who combined Iranian nationalism with radical Islam and hatred of Israel. Both were close to Mehdi Hashemi, a prominent figure in the more revolutionary wing of the clerical establishment actively involved in promoting the export of the revolution. Hashemi's radicalism made him vehemently opposed to any deal with Washington and put him on a collision course with those in the regime who recognized the need for U.S. weaponry to ensure that Iran did not lose the war against Iraq. Indeed, it was Hashemi who was behind the November 1986 leak to the Lebanese newspaper al-Shira that revealed the Iran-Contra affair to the world, for which he was imprisoned, tortured, humiliated in a televised confession, and finally executed. As part of the same crackdown, Seyed Ahmed Kashani was arrested in late 1986 on charges of conspiring against the state and spent more than two years in prison. This is not the profile of a secret emissary to the "Great Satan." Sick acknowledged that there are "dozens of lapses" and "scores of dangling loose ends" in his elaboration of the October Surprise conspiracy. He specifically cautions the reader about Ben-Menashe, "a colorful individual, full of extraordinary tales … [who] cannot be used as a sole source. Everything he says must be independently corroborated." However, Sick failed to perform such due diligence. The corroboration that apparently led him to put faith in Ben-Menashe's testimony was retroactive. Media reports in the wake of the Iran-Contra scandal indicated that an Iranian by the name of Mehdi Kashani was running many of the Islamic Republic's arms procurement efforts in Europe. Kashani's conduit for arms purchases was Asco Malta, a Maltese subsidiary of a Belgian company run by retired Israeli military officer Avraham Shavit. Houshang Lavi, another self-declared participant in the October Surprise conspiracy, supposedly acted as mediator for some of these transactions. In 1992, Mehdi Kashani was arrested in Madrid on charges of running an illegal weapons procurement ring for Iran. He was described in the local media as "a civil engineer and colonel in the Khomeinist army," who had been living in Spain since 1984 and in London before that. He headed a Madrid-based company, Aerofalcon, which he used to procure military technology for Iran. Local reports of his arrest linked Kashani to the Iran-Contra affair. Somehow, he got free and, a few months later, resurfaced in Germany. Since then, Mehdi Kashani has continued to periodically capture the attention of the media. In 1995, a New York Times exposé placed him in Germany where he had partnered with another former Iranian government official to run a small airport, which was apparently used for smuggling weapons. Once exposed, the pair sold the airport and disappeared—but resurfaced three years later in Ireland when an Irish construction company they were both involved in went bankrupt. Soon after, Kashani became the chief operating officer of an Iranian company with Irish connections, which was producing an all-in-one computer, printer, and telephone system. He appears to be living now in Tehran. There is ample evidence to establish that the real Mehdi Kashani procured weapons for the Iranian regime during the 1980s and dealt with retired Israeli officials involved in the arms trade, making him a plausible participant in the October Surprise conspiracy. However, he bears little resemblance to the man Ben-Menashe purports to know intimately. He was not the scion of a prominent clerical family. Having lived in Spain continuously after 1984, he clearly was not the radical firebrand jailed by the Iranian government in 1986-89. Having worked as an oil ministry official in London prior to that, he could not also have been a sitting member of parliament from 1980-86. Ben-Menashe's claim that he and Kashani were close friends and partners in the arms trade is not only wholly unsubstantiated but so poorly contrived as to undermine fatally Ben-Menashe's relevance and credibility as a source. In his book, Ben-Menashe spends some time discussing (inaccurately) the revelation of Iran-Contra in the Lebanese press in November 1986 but not one word on the role, let alone the imprisonment, of Ahmed Kashani. Had Ahmed and Mehdi Kashani been the same person, as Ben-Menashe told Sick, and had Kashani been such an important player in the secret arms dealings Ben-Menashe supposedly conducted throughout the 1980s, then why should he suddenly disappear without mention as he does in Ben-Menashe's book? Had Kashani been such a close friend, why would Ben-Menashe offer not one word of sympathy for his lamentable fate? Could it be that Ben-Menashe had, in fact, no idea about the entire Hashemi affair and also never actually knew much about Seyed Ahmed Kashani? A Mossad agent with a special expertise on Iran would not be so appallingly unfamiliar with the late Ayatollah Kashani, one of the most influential figures in twentieth-century Iranian political history, whose militant political activism greatly inspired the young Ruhollah Khomeini, the Islamic Republic's founding father. Ben-Menashe's account of the October Surprise conspiracy is not merely a "tangled yarn," as Time magazine put it, but a remarkably inept one at that. The truth is that Ben-Menashe was not a participant in some grand conspiracy who later played fast and loose with the facts to suit his own agenda but rather a thoroughly unreliable witness. Although Profits of War is probably more embellished than the version of events he recounted to Sick (he was now trying to capitalize on his newfound fame and sell books), it is an amusing tribute to ignorance of Iran. In describing how Kashani was able to easily pass through customs at Tel Aviv's Ben-Gurion International Airport with a Philippine passport, he explains that Ayatollah Abol Qassem Kashani "had been a close friend of Ferdinand Marcos." Ben-Menashe's ignorance of the fact that the ayatollah was dead by the time Marcos came to power pales in comparison to his naive imagining that a radical Shiite cleric could have had either the desire or opportunity to strike up a friendship with a right-wing, pro-U.S. dictator on the other side of the world. Could Sick have simply failed to pick up on this, leading him to put undue faith in the latter's testimony so long as it was consistent with what he thought he knew? Perhaps, but the inconsistencies between Ben-Menashe's fictional account of "Mehdi" Kashani and the actual lives of these two persons are so glaring that a competent Iran expert should have spotted them quickly and discarded Ben-Menashe's testimony altogether. Sick acknowledges in a footnote that "there is some confusion of names between Ahmed and Mehdi Kashani," suggesting that he may have noticed discrepancies while continuing to imply in the main text that these two disparate people were one and the same person and that this person played a role in the chain of events leading to the October Surprise. This is typical of Sick's ambiguous assertions that can be read in more than one way. He writes, for example, that collusion between the Reagan campaign and Tehran in 1980 "may well have been the first act in a drama that was ultimately to conclude with the Iran-Contra affair." Beyond the inherent ambiguity of using a phrase like "may well," it is not clear whether Sick is saying that the collusion "may well" have happened, or that it happened and "may well" have been the first act. After the publication of October Surprise, Ben-Menashe and the handful of other sources who led Sick down the rabbit hole were quickly discredited. In January 1993, the House October Surprise Task Force concluded that Ben-Menashe's testimony was "wholly lacking of any credibility" and found "no evidence to corroborate Ben-Menashe's allegations regarding Mehdi Kashani's contacts with the Israeli government." Citing evidence obtained from the Israeli government, the task force found that he was a relatively low-ranking employee of Israel's Ministry of Defense who "was never sent to Iran" and that Mehdi Kashani never visited Israel prior to 1985. Ben-Menashe appears to have invented the whole story to cover his back after coming under indictment, and one lie led to another. While his powers of persuasion conned many Western reporters into giving credence to his claims, Ben-Menashe likely had no real connections to any of the characters in his story. He has since moved on to peddle other tales to the gullible, spinning himself as a renegade Israeli James Bond who, inter alia, planted the homing device that led Israeli warplanes to Iraq's Osirak nuclear reactor in 1981 and turned down an offer to become head of the Mossad. One might have expected these findings to be a devastating blow to Sick. Prior to the release of the task force report (but after reportedly accepting $300,000 for the movie rights to October Surprise), Sick himself told Entertainment Weekly, "I've really put my professional career on the line with this book." Others of lesser notability who took the leap certainly suffered professional consequences. "Ari [Ben-Menashe] has put five or six dozen journalists from all over the world through roughly the same paces," wrote Craig Unger, one of many who initially bought into the October Surprise conspiracy. "Listen to him, trust him, print his story verbatim—then sit round and watch your career go up in flames." In contrast, Sick's career has flourished, despite the fact that, unlike Unger, he refused to repent for sending Congress and the mainstream media on a frenzied wild goose chase (from which he personally profited). While acknowledging in a January 1993 op-ed that there was no "straightforward arms-for-hostages deal in 1980," he insisted that the task force report "does not lay … to rest" claims that the Reagan campaign conspired to negotiate such a deal. Indeed, while most of those who rallied behind Sick have stopped trumpeting his claims, few have been willing to fully disavow them. Asked in an interview in 2011 whether he still believes the October Surprise allegations, Jimmy Carter replied, "I don't know the facts … I've read Gary Sick's book and talked to him. I don't really know." While acknowledging that Sick's specific allegations were proven false, political historian Kevin Phillips has, nevertheless, written that the Reagan campaign "probably" cut a deal to delay the release of the hostages. Historians Stephen Ambrose and Douglas Brinkley have even gone a step further by taking this conspiracy theory for granted. That such a blatant lie can last for so long against all available evidence is a sad testament to the corrupting effects of Middle Eastern studies on American public discourse about the region. Emanuele Ottolenghi is a senior fellow at the Foundation for Defense of Democracies. Columbia professor and Carter administration Iran official Gary Sick has replied to my piece in the Spring 2012 issue of the Middle East Quarterly, in which I disputed his long-standing allegation that incoming Reagan administration figures persuaded the Iranians to hold U.S. hostages until after the 1980 election to ensure Carter's defeat. In advancing that argument in his famous 1992 book October Surprise, Sick relied heavily on the supposed actions of a figure named Mehdi Kashani, including a documented arms transaction addressed to a namesake acting on behalf of the Iranian regime in 1983. In my article, I revealed how the Mehdi Kashani at the center of Sick's October Surprise theory is actually an imaginary character created by Ari Ben-Menashe, one of Sick's key sources, through the casual blending of the biographies of two real-life people, neither of whom could have played the role attributed to Mehdi Kashani by Sick in his book. Ben-Menashe is a proven fabricator, and Sick accepted his testimony on faith. He chose to believe Ben-Menashe's story about Kashani because it suited his theory and, once he could document an arms transaction signed by an Iranian man named Mehdi Kashani on behalf of Iran's regime, Sick thought he had corroborated Ben-Menashe's testimony. That's why Sick laments the fact that I focus "exclusively on the confusion of two different individuals – Mehdi Kashani and Ahmed Kashani." Mehdi's and Ahmed's biographic details and ideological predispositions could not have made either present at the alleged meetings Sick believed to expose in his book. But a creative blend of their life-stories made Ben-Menashe's fictitious character perfect for Sick's purposes. Throughout his years of painstaking research into the October Surprise, Sick failed to appreciate the implications of this name confusion (which readers can explore at length in my piece). Had he done so, Sick would have addressed it in the full light of day. Instead he liquidated the problem in a short footnote, as an afterthought, by laconically stating "there is some confusion of names between Ahmed and Mehdi Kashani." I am actually grateful that he has now, belatedly, acknowledged his mistake: "It is true" writes Sick in his reply to my article, "that Menashe melded these two different individuals in his story." It is not true, however that Sick "clearly pointed out the confusion in the names." Despite recognizing the flaw in his argument, Sick holds me in contempt for relying on subterfuge to obtain a copy of the document posted above and failing to thank him in the less than complimentary article I subsequently devoted to him: "Ottolenghi fails to mention that the arms transaction was between Israel and Iran, that Mehdi Kashani was indeed an arms dealer involved in transactions between Israel and Iran, that my book October Surprise was precisely correct about the arms transaction, and that I had personally provided him a copy of the contract that proved it." I never doubted that Kashani was an arms dealer or that Israel and Iran conducted arms transactions in the 1980s. In fact, I wrote: "There is ample evidence to establish that the real Mehdi Kashani procured weapons for the Iranian regime during the 1980s and dealt with retired Israeli officials involved in the arms trade." Sick did provide me a copy of the document, which is actually an invoice, not between Israel and Iran, but between Iran's London-based representative, Mehdi Kashani, and a Belgian company's Maltese subsidiary, Asco Malta. It is signed by a Flemish executive, Mr J.C. Van de Putte. But I quibble. Sick's courtesy notwithstanding, I still find his reliance on it curious. It's dated 21 January 1983. How could it constitute evidence of a political deal between Reagan and Tehran, three years earlier, in 1980? Or prove that the Kashani described by Ben-Menashe was the same man to whom the invoice was addressed? The assumption that documents signed in 1983 by a Flemish arms dealer in Brussels, addressed to a London-based Iranian arms' procurer, constitute even circumstantial evidence for Sick's theory rests on whether the arms procurer himself is the same character described by Sick, on the basis of the testimony of utterly unreliable Ben-Menashe. That is why I focused "exclusively on the confusion" between Mehdi and Ahmed. That confusion made all the difference between truth and fiction. That footnote is a fig leaf. Without the Kashani character as painted by Ben Menashe there is no October Surprise. Sick, however, cannot bring himself to look at this clearly. Instead, he reduced himself to ad hominem attacks against me and a research assistant. Her only sin was to collect a document that, unbeknownst to her, would successfully challenge a scholar-advocate whose career has dangled precariously from a footnote, and now reveals his work to be flawed beyond repair. Fear not though—given the politicization of Middle East studies and the field's inordinate affection for ideological crusaders, I am confident no one will hold this lack of scholarly rigor to account. Daniel Pipes, "The 'October Surprise' Theory," in Conspiracy Theories in American History: An Encyclopedia (Santa Barbara, Calif.: ABC-Clio, 2003), vol. 2, pp. 547-50. Gary Sick, "The Election Story of the Decade," The New York Times, Apr. 15, 1991. Ted Goertzel, "Belief in Conspiracy Theories," Political Psychology, 15 (1994): 733. See, in particular, Steven Emerson and Jesse Furman, "The Conspiracy That Wasn't," The New Republic, Nov. 18, 1991; John Barry, "Making of a Myth," Newsweek, Nov. 11, 1991. The "October Surprise" Allegations and the Circumstances Surrounding the Release of the American Hostages Held in Iran, United States Senate Committee on Foreign Relations (Washington, D.C.: Government Printing Office, 1992); Joint Report of the Task Force to Investigate Certain Allegations Concerning the Holding of American Hostages by Iran in 1980, Committee on the Whole House on the State of the Union (Washington, D.C.: Government Printing Office, 1993). Gary Sick, "The Decade's First Revolution?" The Daily Beast, Jan. 2, 2010. Gary Sick, "The Worst of Both Worlds," Foreign Policy, Jan. 29, 2011. "Investigatory Powers Authorization," U.S. Senate, Congressional Record, Nov. 22, 1991, p. S17643. Barry, "Making of a Myth." Gary Sick, The October Surprise: America's Hostages in Iran and the Election of Ronald Reagan (New York: Times Books, 1992), p. 70. Ari Ben-Menashe, Profits of War: Inside the Secret U.S.-Israeli Arms Network (New York: Sheridan Square Publications, 1992), chap. 3. Ibid., chap. 4 and 5. Abbas Milani, Eminent Persians (Syracuse: Syracuse University Press, 2008), vol. 2, p. 343. See Kashani's biographical details on the Iranian parliament's website, "Sayed Ahmed Mustafa Kashani." David Menashri, "Iran," in Itamar Rabinovich and Haim Shaked, eds., Middle East Contemporary Survey, (Vol. 9) 1984-1985 (Tel Aviv: The Moshe Dayan Centre for Middle East and African Studies, 1987), p. 456, fn. 7. Bahman Bakhtiari, Parliamentary Politics in Revolutionary Iran (Gainesville: University Press of Florida, 1996), p. 137. Milani, Eminent Persians, vol. 1, p. 344. The New York Times, Sept. 29, 1987. The Straits Times (Singapore), Nov. 10, 1986. Sick, The October Surprise, p. 7. Serge Dumont, "Les secrets du dossier," Le Vif/L'Express (Roeselare, Belg. ), Jan. 30-Feb. 5, 1987, pp. 8-11; idem, "Asco-Malte: le contrat iranien," LeVif/L'Express, Feb. 6-12, 1987, pp. 8-11. Sick, The October Surprise, p. 220. El Diario (Madrid), Mar. 13, 1992. ABC Hemeroteca (Madrid), Mar. 13, 1992. Der Spiegel (Hamburg), Nov. 15, 1993; Rudolf Lambrecht and Leo Mueller, "A Center for Arms Dealers?" The Hamburg Stern, Dec. 8, 1994. The Sunday Business Post (Dublin), July 5, 1998. Mehdi Kashani, interview, Tehran Times, Aug. 22, 2005. Milani, Eminent Persians, vol. 1, p. 345; Baqer Moin, Khomeini: Life of the Ayatollah (London: I.B. Tauris, 2009), pp. 68-9. "Spinner of Tangled Yarns," Time, Oct. 28, 1991. Ben-Menashe, Profits of War, chap. 4. Sick, The October Surprise, p. 6. Ibid., p. 292, fn. 24. Joint Report of the Task Force to Investigate Certain Allegations Concerning the Holding of American Hostages by Iran in 1980 [October Surprise Task Force] (Washington, D.C.: U.S. Government Printing Office, 1993), p. 7. "Investigatory Powers Authorization," p. S17643. Entertainment Weekly (New York and Los Angeles), Jan. 24, 1992. Craig Unger, "The Trouble with Ari," The Village Voice (New York), July 1992. Gary Sick, "Last Word on the October Surprise?" The New York Times, Jan. 24, 1993. Brian Till, "Jimmy Carter: As a Nation We're Bad at Making Tough Decisions," The Atlantic, May 16, 2011. Kevin Phillips, American Dynasty: Aristocracy, Fortune, and the Politics of Deceit in the House of Bush (New York: Penguin Books, 2004), pp. 278–90. Stephen Ambrose and Douglas Brinkley, Rise to Globalism: American Foreign Policy since 1938 (New York: Penguin Books, 2011), p. 301. On Apr. 3, 2004, Brinkley acknowledged that "the October Surprise statement in Rise to Globalism is unprovable/incorrect" and promised that "it will be fixed in the next edition due out in early 2005." The next edition was published in 2011, and the offending passage remained in situ. See, Daniel Pipes, "Further on the 'October Surprise' Conspiracy Theory," DanielPipes.org, updated Sept. 6, 2011. Related Topics: Conspiracy theories, Iran, US policy, US politics | Emanuele Ottolenghi | Spring 2012 MEQ receive the latest by email: subscribe to the free mef mailing list This text may be reposted or forwarded so long as it is presented as an integral whole with complete and accurate information provided about its author, date, place of publication, and original URL.